At the eastern end of Eastern docks, at the point where the dock road turns seawards, high in the cliffs can be seen two bricked in tunnels. One is the entrance and the other the exit to what were twin tunnels that were part of the unique coal carrying Aerial Ropeway. The Kent coalfield was discovered at the end of the nineteenth century and in 1896 entrepreneur Arthur Burr formed the Kent Coal Field Syndicate and bought the mineral rights. 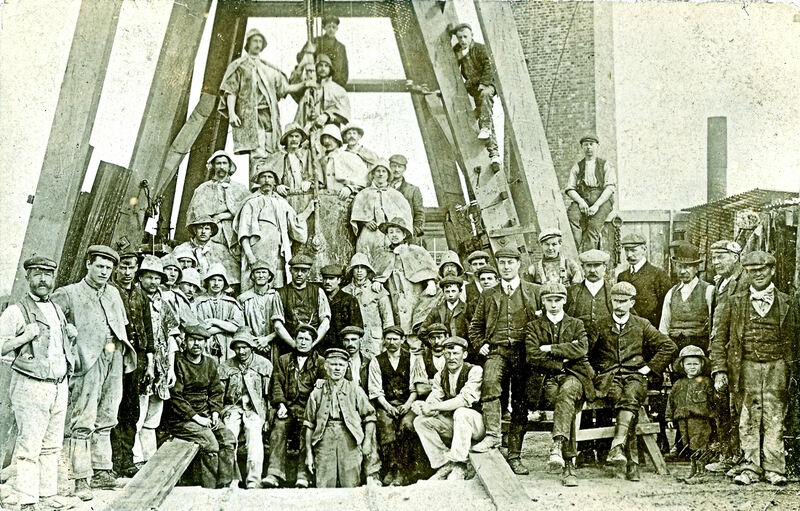 The first shaft named after Francis Brady – the engineer who first established that the Kent coalfield existed – was at the new Shakespeare Colliery, Dover and work on sinking it started that year. Even though the Colliery proved unproductive the continual demand for coal encouraged other borings to be undertaken in and around the Dover area and a total of 14 coal seams, stretching from Dover almost to Herne Bay, were eventually found. It had been envisaged to sink 15 mines but in the event only four became commercially viable one of which was near the village of Eythorne, northeast of Dover, and named Tilmanstone colliery. 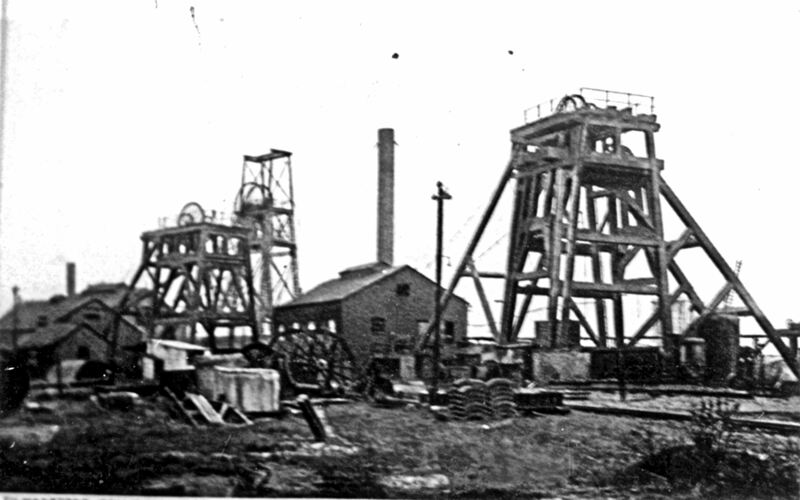 Work began on Tilmanstone colliery in 1906 by Arthur Burr through two of his many companies, Foncage and Sondage syndicates. Beset by bad geology and inadequate capital resources it was not until May 1908 that the first shaft of Tilmanstone colliery had reached 913-feet. At the time, the bricking had only been undertaken to a depth of 631-feet and in consequence the shaft started to collapse. A second shaft was started on 19 November 1907 but again due to the lack of financial resources there were many delays and in 1909 a hoppit (hoist bucket) fell down the shaft. Three sinkers were killed, pump pipes were destroyed causing water to pour in and the shaft was abandoned for nine months. 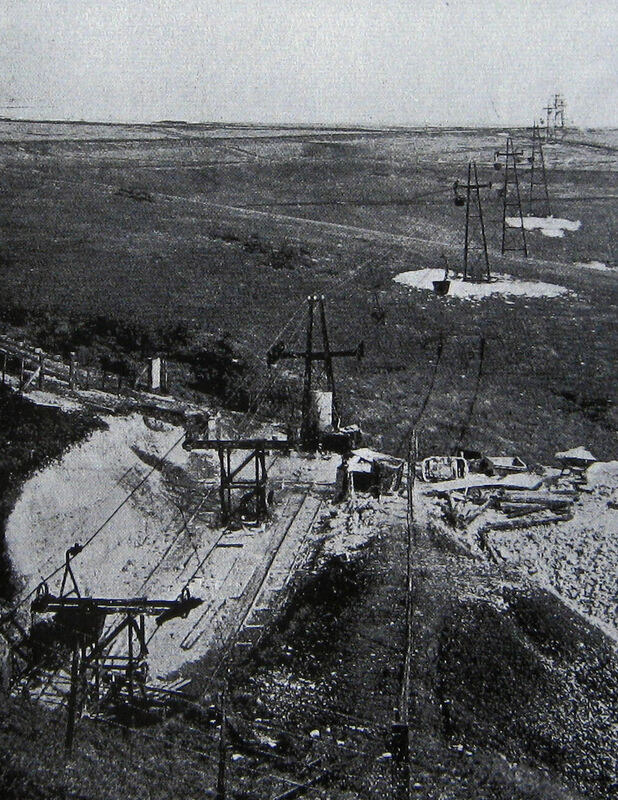 In August 1910, the third shaft was started and sinking was slow until electric pumps were installed in 1912. By December that year all three shafts had reached coal measures and in March 1913, shaft No1 hit the 1,590-feet deep Beresford seam. Commercial operations were started, then a year later on 14 January 1914, the colliery went into receivership. The shareholders replaced Burr and rescued the company, which became the East Kent Colliery Company. A year later one of the East Kent Colliery Company shareholders, Richard Tilden Smith, made a bid to purchase Tilmanstone colliery but was thwarted. Tilden Smith was born in New South Wales, Australia on 14 October 1865, the son of a banker who died when Tilden Smith was 16 but left property in a gold field. Tilden Smith was a keen sportsman who as a youth showed unnerving business acumen and before he was 21 years old owned 5-million acres of land and 75,000 head of cattle. 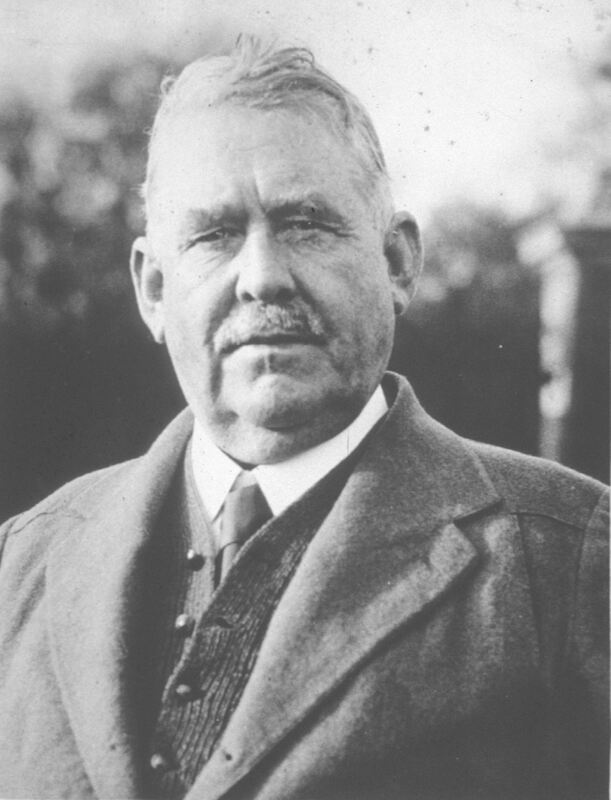 Tilden Smith also played a prominent part in the opening of the Australian South Maitland coalfield that was the most extensive coalfield in New South Wales. However, the Australian banking crisis of 1893 hit Tilden Smith hard and he came to England a comparatively poor man. Shortly after the South African gold rush started and Tilden Smith went to try his luck there by refinancing derelict property, which proved a successful venture. Providing him with a healthy bank account, Tilden Smith returned to Britain to make his fortune. He was one of the founding members of the British Bank of Northern Commerce – later incorporated into Hambros. In 1905 he became involved in one of Burr’s companies, Kent Collieries Ltd and in 1910 a new company Channel Collieries Trust Ltd was set up with particular interest in Shakespeare Colliery. In 1905 he became involved in Kent Collieries Ltd that owned Shakespeare Colliery and in 1910 a new company Channel Collieries Trust Ltd was set up with particular interest in Shakespeare Colliery. One of the major shareholders of Channel Collieries Trust Ltd was Sir Arthur Dorman (1848-1931) who along with Albert de Laude Long, had formed Dorman Long and Co in 1875 – steel makers, constructional engineers and bridge builders. In 1896 Burr has set up Kent Coal Concessions with the purpose of buying potential underground coalfields but not surface land. By 1910, Burr was Manager or Director of at least twenty-two different companies, all of which had his Kent Coal Concessions Ltd as a major shareholder. In 1913, these were consolidated under the name of Kent Coal Concessions and Dorman Long held 30,000 shares in the consolidated company. In 1914, Burr was forced to resign from all his posts and faced several legal actions for fraud and misuse of funds. Encouraged by the Treasury, a reconsolidation of Kent Coal Concessions began and out of this, in 1917, the Channel Steel Company, whose major shareholder was Dorman Long, was created. The severely reduced Kent Coal Concessions remained and made Castle Hill House their headquarters but in 1925, the company folded. In the meantime near Swansea, south Wales, Tilden Smith had bought a colliery from which the Swansea Vale Spelter works bought their coal. The German Company Aran Hirsch and Shon of Halderstadt owned the spelter works which made commercial zinc. Then in 1908, along with the future President of the United States – Herbert Hoover (1874-1964), Tilden Smith reopened old mine workings at Namtu, Burma (now Myanmar) belonging to Burma Corporation. The Corporation were the owners of the largest silver, lead, zinc and copper mines in the world. The following year, on 9 August 1909, the Dover, St Margaret’s and Martin Mill Light Railway Company was formed by Sir William Crundall – Chairman of Dover Harbour Board (DHB), Weetman Dickinson Pearson, 1st Viscount Cowdray – whose company had built Dover’s Admiralty Harbour and civil engineer John Jackson who built the Prince of Wales Pier. These three men owned 25 shares each of the new company and four others owned one share each. One of these shareholders was Tilden Smith but at a closed meeting held on 13 April 1913, Sir William Crundall and Viscount Cowdray announced that they were selling their shares by transfer, to the Channel Collieries Trust. Not only was Tilden Smith and the other three single shareholders not invited to the meeting, the first that Tilden Smith heard about the deal was when he read about it in the national newspapers. A bitter legal battle ensued where Tilden Smith unsuccessfully tried to seek redress. Following the outbreak of World War I (1914-1918) Britain was short of zinc – an important constituent of brass along with copper – and in response Tilden Smith purchased the German owned Swansea Vale Spelter works. He subsequently established an up-to-date zinc smelting plant at nearby Avonmouth, where mustard gas was also produced. Ironically, later in the War Tilden Smith‘s only son succumbed to mustard gas and died of the poisoning some years later. In 1915 Tilden Smith, with an eye still on the Kent coalfield, made the bid to purchase Tilmanstone colliery mentioned above. However, that year he consolidated all Welsh holdings into the National Smelting Company and with the co-operation of the Government increased the production of commercial zinc. Two years later Tilden Smith incorporated the company to include his holdings in the Burma Corporation that he had increased having bought Hoover’s shares. By this time, Tilden Smith was a director of a number of other companies including Baldwin’s, a large steel and galvanised tin manufacturer in South Wales that also owned a number of collieries. 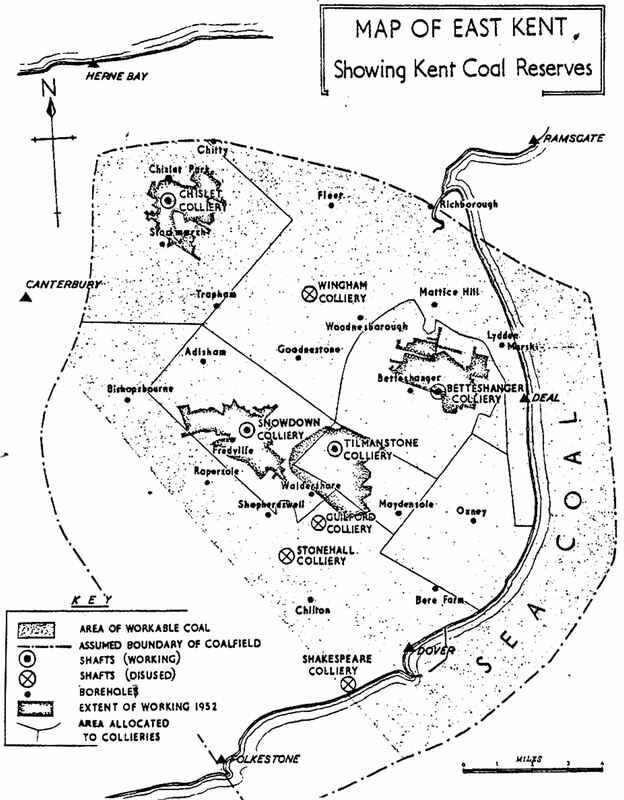 Kent Coalfield – Map showing the extent of coal reserves in East Kent. During the War, East Kent Colliery Company’s Tilmanstone Colliery made a profit and in the couple of years that followed, further sinking of No 3 shaft took place with the plan to reach the deep but rich Milyard seam. However, in the early 1920s, the company was hit by the prevailing economic depression and cheaper imported coal. Production was already reduced and in 1922, a severe in-burst of water into the Beresford seam cut production even more. That year Dorman Long joined forces with Viscount Cowdray to form Pearson and Dorman Long Ltd. 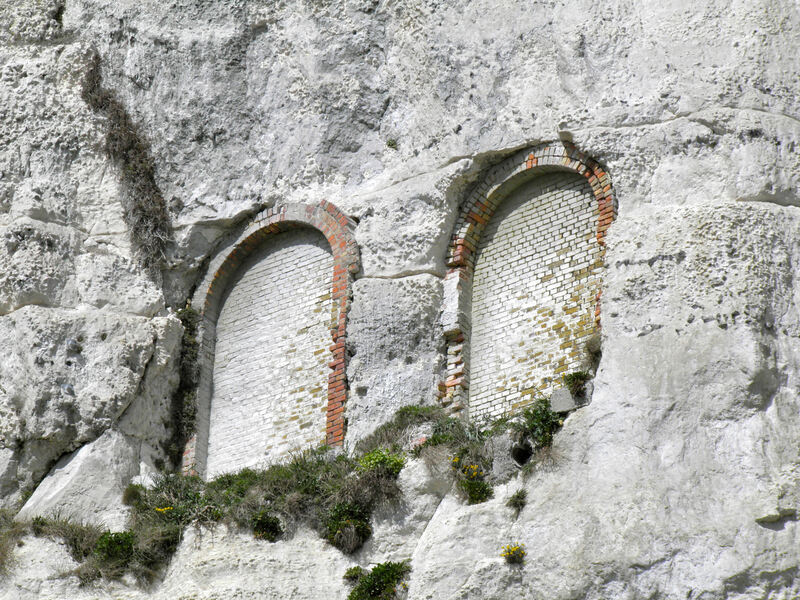 The new company immediately started the preliminary work on what eventually became Betteshanger Colliery and through the Channel Steel Company, they proposed the building of a steel works on the cliffs between Dover and St Margaret’s. In 1918, with a total subscribed share capital of £1million, Tilden Smith had formed the National Metal and Chemical Bank, which became his main holding company. He sold his interests in the smelting works and Burma mines to the Bank in 1923 and set up the Share Guarantee Trust. 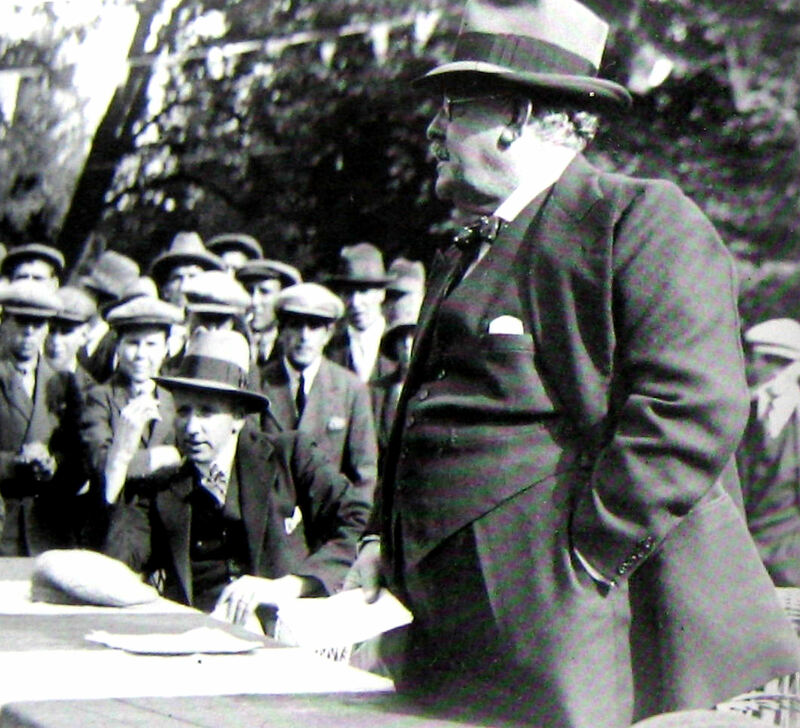 Through the Trust he bought shares from the panic-stricken shareholders in the East Kent Colliery Company and at the end of 1924, the Share Guarantee Trust forced the East Kent Colliery Company into receivership. The Share Guarantee Trust held nearly a third of the first mortgage debentures in the colliery. On 13 February 1925, the Official Receiver, reluctantly and against the wishes of the directors of East Kent Colliery Company, appointed Tilden Smith as the general manager of the colliery while its future was decided. The directors put forward a scheme that on paper looked as if it could work, but no backers came forward putting the pit in danger of closure. Tilden Smith then set up a new company, Tilmanstone (Kent) Collieries Limited, and after showing considerable acumen as the colliery manager in July 1925 applied for permission to reconstruct the colliery. This was to be based on a reconstruction programme submitted by F D Mottram and was approved by the mortgage debenture holders and the Court of Chancery. Through Tilmanstone (Kent) Collieries Limited, Tilden Smith acquired the assets of Tilmanstone colliery for £139,667 but not the colliery itself as this was still in the hands of the debenture and shareholders. The first mortgage debentures, amounting to £122,710 were exchanged on equal par for the first mortgage debentures in the old company – the majority of which were held by Share Guarantee Trust! The second debentures in the old company amounted to £203,871 but the holders of these had no right of call so lost their money. However, Tilden Smith did issue 400,000 second mortgage debentures at par, initially to those who had lost their money and then the general public but charged 10% commission on the dealings. Due to the lack of interest, there was little take up so Share Guarantee Trust bought 97.3% of them! In the old company the share capital had amounted to £490,583, the largest owner of which was Barclays Bank with 3.22% but they lost their money. However, shares to the value of £40,000 were offered on the open market in Tilmanstone (Kent) Collieries Limited. As far as the colliery was concerned, the Official Receiver accepted Mottram’s reconstruction programme to be instigated by Tilden Smith. Of note, from 1920 Mottram was Tilden Smith’s private secretary, a role that was to continue up until December 1929. The total mining area of Tilmanstone colliery, at this time, was 7,956acres and nearby was the East Kent Light Railway, a feeder track to Shepherdswell and then into the Southern Railway main line between Dover and London. By rail, the distance to London was 74½ miles and to Dover 9½ miles where Dover Harbour Board (DHB) encouraged coal and timber merchants to set up business on the quaysides of both Wellington and Granville Docks. Railway lines had been laid to both docks to connect with Southern Railway. Transport by road to either London or Dover was poor. The output of coal from Tilmanstone in 1925 was 239,000 tons, 65% of the total output from the Kent coalfields. No 1 shaft to the 5-feet thick Beresford seam was worked at a depth of 1,560-feet and was proved at Tilmanstone for an area of 2,000 acres. The initial mining technique was long wall but due to leakage through the roof, that was abandoned and the pillar and stall method was used instead. The number of miners, in 1925, was 854 – 41% of the Kent coalfield labour force – but the working conditions were bad. The price per ton of coal from the Kent mines that year was 18shillings 9pence a ton which compared unfavourably with the average price of 16shillings 4pence a ton from the other British coalfields. The advantage the Kent coalfield did have was its proximity of the southeast and especially the London market. As manager of Tilmanstone, the first thing Tilden Smith did was to look at creating greater co-operation from the miners and to persuade them that, as things were, the colliery was not financially viable. In 1924, following a national wage award, the miners had been given notice by the owners to terminate their agreements and to be paid a lower rate. 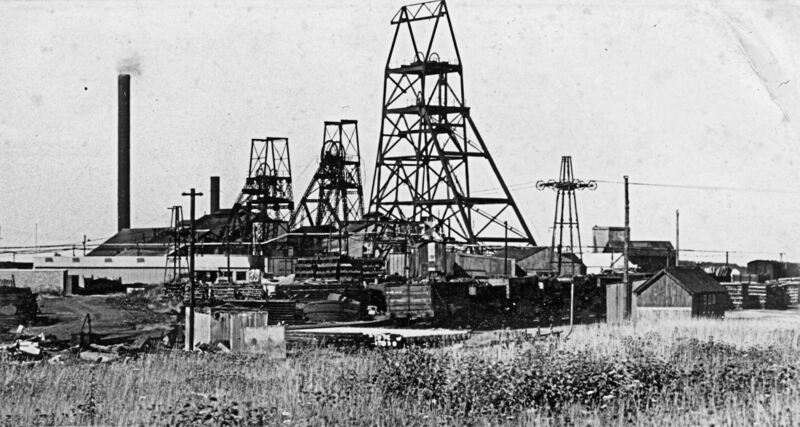 This had led to a dispute that resulted in a higher pay award that the directors of the East Kent Colliery Company could not afford. It was because of this that Tilden Smith had forced the Company into receivership. Then on Thursday 22 October 1925, Thomas Clark age 17 of Prioress Way, Dover, was killed following a roof fall in the mine. He had been a miner, alongside his father, since he was 14 and the accident was caused by a bar, holding up the roof, having broken due to deterioration. On 3 December the previous year, before Tilden Smith had taken over as manager, a steam/water separator in the electricity generating plant had exploded. Made of cast iron by the British Westinghouse Electrical and Manufacturing Company, it had been installed in 1911. Steam at high pressure passed through the separator and in 1917 three cracks on the same side were found. A steel plate was put over the area with the intention of the East Kent Colliery Company to replace the separator but this had not happened. Luckily, no one was killed although a number of workers were injured. Nonetheless, due to lack of money only a temporary repair had been made. Throughout the British mining industry at that time, cheap imported coal had led to short-time working, wage cuts and unemployment with the consequence of increasing unrest. In the spring of 1926, the strength of sterling had caused the price of imported coal to fall lower than that produced domestically and a Royal Commission recommended a further cut in the miners’ wages. In his evidence to the Commission, Tilden Smith strongly argued for the government to create a Coal Board under which all collieries in the country would be compulsorily amalgamated. This, he reasoned, would enable the industry to be put on a sound economic footing. Little notice was taken of Tilden Smith or of others mine owners who were putting contrary to conventional arguments forward. Sir Arthur Dorman, was another that fell into this category following his powerful and well reported speech (Economist 19.12.1925) on exchange rates. He virtually begged the government for equal parity but the response was, ‘a strong £ was the sign of a strong country.’ (Dover, St Margaret’s and Martin Mill Railway Line part 2). Bill Newman Mayor of Dover 1992-1993 son of Bill Newman, one of Tilmanstone colliery union representatives during the time when Richard Tilden Smith owned the colliery. The first General Strike in British history began at midnight on 3 May 1926. Out of fear of a Bolshevik type revolution, a National State of Emergency was declared. Under the leadership of the Kent Miner’s secretary, John Elks, the Dover Central Strike Committee was set up and this included the union representative of Tilmanstone colliery, Bill Newman. His son, of the same name, was active in local politics up until recently. For the miners the strike lasted six months and throughout that time, Tilden Smith contributed £100 a week towards the cost of food for the miners’ wives and families. Meanwhile, he took the opportunity to improve the efficiency and working conditions of Tilmanstone colliery. Water ingress into the Tilmanstone mine amounted to 20-tons per ton of coal produced. As a result, the existing pumping machinery had to deal with 2,000-gallons of water per minute (almost 9 tons per minute). When Tilden smith was appointed manager, pumps existed at three stations down the mineshaft. At the 600-feet level, the 1,140-feet level and in the Beresford seam at the 1,560-feet level. With the existing machinery the estimated cost of pumping per ton of coal raised was 2shillings 6pence. Tilden Smith had a new, larger and more efficient electricity generating plant installed to work the largest pump in the country at that time, nicknamed Lady Gray. The 1,050-horsepower (785 kilowatt) pump was capable of lifting 1,500-gallons of water a minute to the surface directly from the Beresford seam 1,560-feet below! The new electricity station had the capacity to produce 8,000 kilowatts (8 megawatts); generating at 3,000 volts (3kv) with live superheated steam at 150-200lbs per square inch (psi) while the pit itself provided the cooling water of 1,800-2,000-gallons per minute. A second generator was later acquired, (1929), to provide electricity specifically to work the Lady Gray. 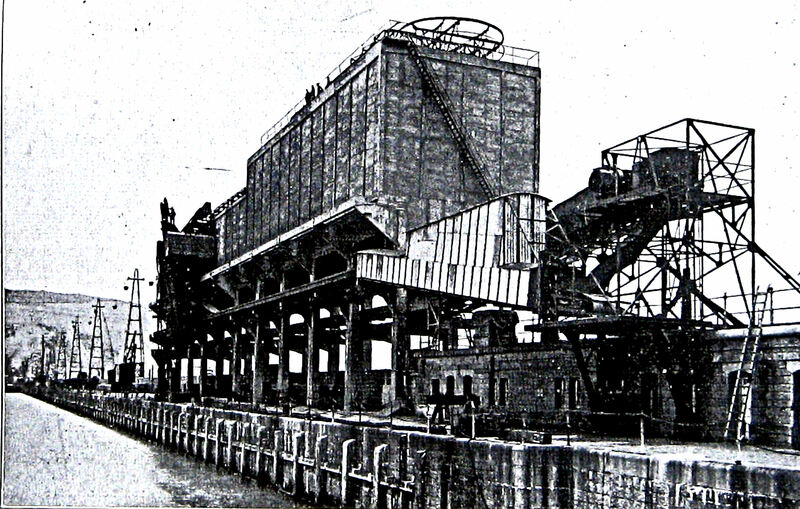 New winding and haulage gear were installed during the 1926 refurbishment, along with two triple-decked cages each capable of carrying 12 men or 6 tubs of coal. From the top to bottom, 1,560-feet below ground, they took 47-seconds. The winding rope used was one and five sixteenths of an inch in diameter with a breaking strain of 120-tons. Along with new surface and coal cleaning plants, a new boiler to pulverize coal was installed. These were introduced to deal with poor quality coal, which was crushed and then mixed with pitch. The mixture was ‘cooked’ using super-heated steam from 400º to 500º Fahrenheit and then pressed into either rectangular industrial brickettes or ovoid shaped ‘Coaloid’ – the commercial name. Coaloid was sold to householders as Tilmanstone New Coal … that ‘burnt freely with a cheerful flame and gave off great heat.‘ The plant cost £15,000 and was designed to produce 10-tons of Coaloid and 10-tons of briquettes an hour. Both were a great success especially as they were weather proof and cheaper than domestic coal. As part of his long-term plans for the colliery Tilden Smith applied, in September 1926, to Dover Corporation to sanction an aerial ropeway connecting Tilmanstone colliery with Dover Harbour for the conveyance of coal. He was advised that the council were unable to sanction such a ropeway as it was a Rural Council matter but that they promised moral support. The Rural Council said that they would discuss the proposition but shelved it. In October, Tilden Smith registered, with a capital of £100 in £1 shares, Tilmanstone Transport Co to carry coal and other products by rail. At the same time, he applied to the Railway and Canal Commission, for the power to erect an aerial ropeway for a distance of 6½ miles (this was as stated in the original application) between the colliery and the Eastern Arm of the Eastern Dockyard. The proposed cost given was £61,195 and the application stated that the aerial ropeway would be carried on poles or standards of steel or ferro-concrete about 120yards apart. Where the ropeway crossed roads there would be bridges of the girder or suspension type. Fixed steel buckets would each carry between 5 and 10 hundredweight (cwt) of coal and be suspended by little trolleys from the ropeway. The proposed course of the aerial ropeway crossed land owned by 18 different personages one of which was Southern Railway – the chief opponent of the project. They saw the proposal as a test case … if Tilmanstone (Kent) Collieries Ltd were given the power to erect such a cheap means of transport; nationally it could remove from the hands of Railway Companies a very large part of their traffic. Pearson and Dorman Long Ltd took a great deal of interest but did not object outright. It would appear that they opposed the project because it would make Tilmanstone coal cheaper than the coal from their mines but if Tilden Smith won, then Southern Railway would be obliged to lower their freight charges for the carriage of coal. At the time the charge from Tilmanstone to the harbour was 5shillings 9pence a ton of coal. Tilden Smith had estimated the cost of transporting a ton of coal using an aerial ropeway would be 1shilling 9pence a ton. DHB were also ambivalent in their response. On the one hand, they recognised that the proposed aerial ropeway would bring considerable trade to the Harbour without any expenditure on its part. 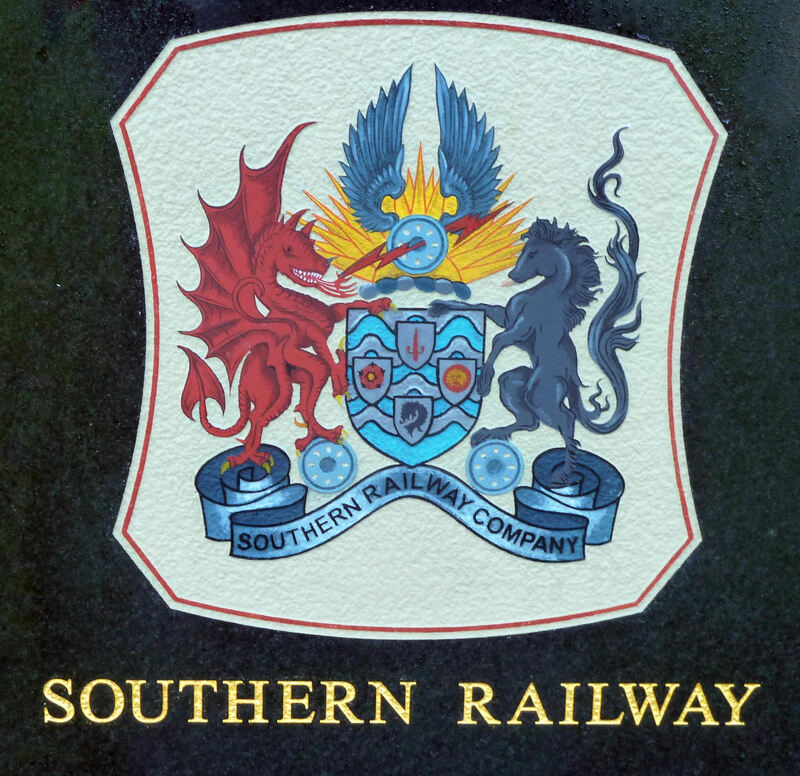 On the other, two members of the Board were representatives of Southern Railway. The Railway and Canal Commission met on 5 November and the case was heard by Mr Justice John Sankey, (1866-1948), Major Sir Edward Hale Tindal Atkinson, (1878-1957) and Sir Lewis Coward who deferred the application to a full Hearing. Nonetheless, Tilden Smith immediately applied for planning permission. At the beginning of November the miners drifted back to work at their old wage rate and the Official Receiver gave his permission for Tilmanstone (Kent) Collieries Ltd to run the mine. On Wednesday 17 November, Tilmanstone colliery reopened and the men were given 48hours to return otherwise there was no guarantee of a job. Over 700 men reported to work and were given a new contract with Tilmanstone (Kent) Collieries Ltd. Immediately the long-wall system of mining was readopted. 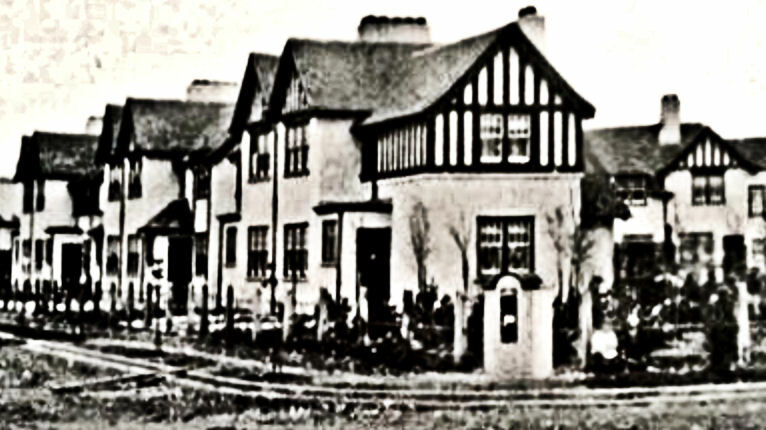 Tilden Smith also instituted plans to improve industrial relations by converting Elvington Court, a country house that he owned, into a residential club with accommodation for some 150 single workers. The adjacent large barn was converted into a miner’s leisure centre and had a seating capacity of 750. Electric lighting and heating was installed, a dance floor laid and a stage erected with dressing rooms behind. Smaller rooms were created where training sessions could be held, classes in various subjects took place and interest groups met. Adjacent to the barn a fully equipped ambulance station was erected with breathing and rescue appliances and a motor ambulance. The Mining Industry Act of 1926 required that all the underground workers had to be men over the age of 18years and to have been employed regularly in the industry prior to April 1926. Throughout the industry, following the strike, there was high unemployment so in mining districts adverts were placed in local newspapers offering work, good pay and accommodation for experienced miners. Some men did write to ask for work but the majority just arrived, many walking, from Durham, Lancashire, Yorkshire and south Wales. 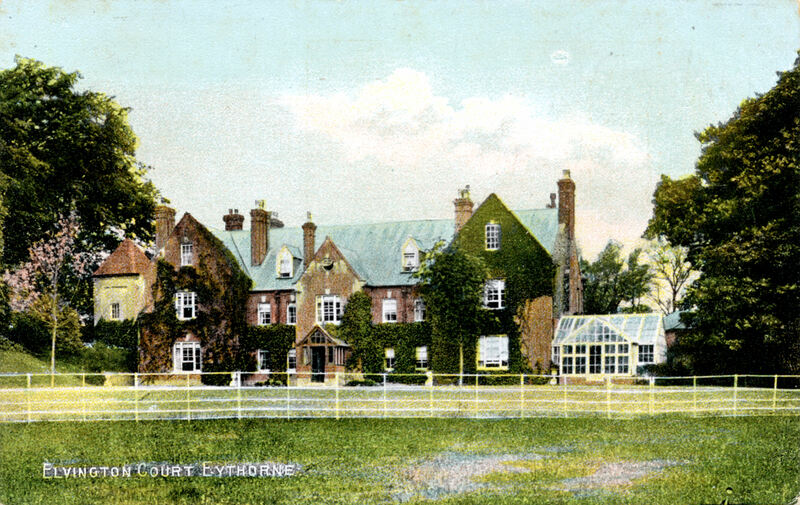 Tilden Smith responded by developing Eythorne village, which was near the colliery, for his married employees. For this project, he set up a joint subsidiary company, Elvington Tenants Ltd, with funding through his National Metal and Chemical Bank and formed an agreement between that company, Tilmanstone (Kent) Collieries Ltd and Eastry Rural District Council to build houses and infrastructure. Financed by Elvington Tenants Ltd when the homes were completed they were to be leased to Tilmanstone (Kent) Collieries Ltd for renting to its employees who would later have the option to buy. In the spring of 1927, Tilden Smith leased 24 acres of land at Langdon Hole from the War Office for a proposed cement works but in March 1927 the case before the Railway and Canal Commission opened and lasted 9days. Tilden Smith had applied for permission to erect an aerial ropeway under sections 3 and 5 of the Mines (Working Facilities and Support) Act 1923. The main thrust of his argument was that Southern Railway charged 5shillings 9pence a ton to transport coal to Dover harbour. This, he argued, made it impossible to produce coal at a competitive rate for export and if continued the colliery would have to close. DHB remained on the fence and besides Southern Railway, the application was opposed by East Kent Light Railway Company – controlled by Southern Railway since 26 March 1926, the Channel Steel Company, Pearson Dorman Long, the War Office, the Commission for Crown Lands, Earl Guilford of Waldershare and Misses Zilla and Susannah Gray of Wigmore Farm, Eythorne. A number of those who had opposed the proposal before the preliminary Hearing in November had withdrawn their objections. In their opening statement, Southern Railway made it clear that they had a business to run and that it was not in their interests to carry coal at a loss in order to help the development of the Kent coalfield. However, they did agree to reduce their rates to 2shillings 8pence a ton if the amount of coal they carried from any one mine was between 200,000 and 250,000 tons a year subject to a Railway Rates Tribunal agreement. As part of his evidence, Sir Herbert Walker (1868-1949) General Manager of Southern Railway (1923-1937) described an alternative Southern Railway proposed scheme for exporting coal from Dover. This, he said, was in conjunction with DHB and centred on the erection of four or five coal staithes on the Eastern Arm with room for the marshalling of wagons on reclaimed land under the cliff. It was anticipated that as soon as the Hearing was over, £35,000 would be spent on the construction of two of the coal staithes. Coal would be brought to Wellington and Granville Docks for unloading onto railway wagons and using the Seafront Railway the wagons would be taken to the new coal staithes where it was expected some 1½ to 2 million tons of coal a year would be processed. He finished by saying that on 17 March Southern Railway would be submitting an application for permission to carry coal on the Sea Front Railway. Towards the end of the Hearing, DHB had a change of attitude saying that they were totally committed to Tilden Smith’s proposal of an aerial ropeway and that a special modern coal staithe would be built. Into this, the buckets from the aerial ropeway would empty and from the staithe, ships would be automatically loaded with coal. The empty buckets would return to the colliery to be filled again and start once more on the circuit. As far as was practically possible the whole process would be fast, efficient and automated. In its judgement, the Court stated that they agreed with Tilden Smith’s proposal of an aerial ropeway on the grounds of economy, efficiency and safety but that the application failed on technical grounds, as the plans submitted on the last section of the proposed ropeway at Eastern Dockyard were inaccurate and the estimates illusionary. This related to conflicts with the last minute evidence given by DHB. The case had cost Tilden Smith £5,000 and he was exasperated. 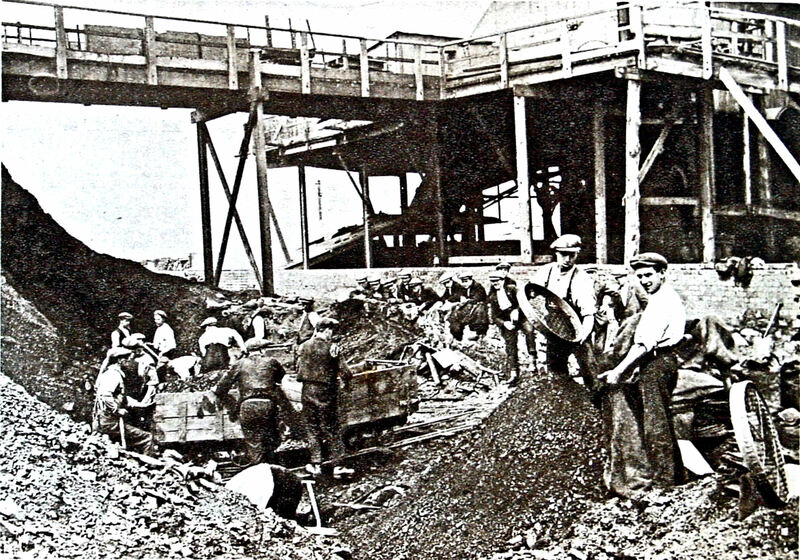 On 17 March 1927, Southern Railway did seek permission to carry coal on the Sea Front Railway and the following day 900 men working at Tilmanstone Colliery received two weeks notice that the pit was to close. They were told that typically, for the week ending 5 March the cost of producing and transporting a ton of coal was 17shillings 2½pence, the price received per ton was 14shillings 4 3/4pence. The Mayor of Dover, Richard Barwick, who was also a DHB Board member, issued a statement saying that the majority of 900 men lived in Dover and had some 5,000 dependents. Because of the lay-offs so shortly after the prolonged strike, he feared that in a very short time many of the miners’ dependents would have to go to the Board of Guardians to survive. This and other publicity surrounding the judgement led to a public outcry and pressure was put on Tilden Smith to keep the mine open. Tilden Smith did and he also renewed his application for the Ropeway producing well-drafted plans and full costings for the final part of the proposed ropeway. These were drawn up with the help of DHB Register, John Mowll. The Hearing was held on 27 July 1927 and Southern Railway were asked that if permission were given, would the two Southern Railway members on the Board of DHB be opposed to the Board co-operating with Tilmanstone Colliery in building a coal staithe on the Eastern Arm? Southern Railway’s representatives assured the Tribunal they would not object and after a three-day Hearing, the Railway and Canal Commission granted the application. Preparations were started by the engineers from Tilmanstone colliery headed by Bernard Whitaker and Richard Barwick’s building firm under the supervision of Ropeways Ltd, Aldwich House, London – later British Ropeway Engineering Company. However, Southern Railway together with the East Kent Light Railway appealed against the Railway and Canal Commission’s decision. Their argument was that the Commission did not have the power to grant means of communication such as an aerial ropeway. When the Appeal was filed work on the Ropeway was suspended pending the outcome. The Appeal took place in November 1927 before Lord Justice Thomas Scrutton (1856-1934), Lord Justice Charles Sargant (1856-1942) and Lord Justice Frederick Greer (1863-1945). Southern Railway expanded their argument by saying that the ‘Commission did not have the jurisdiction to order that anyone could construct railways over the face of other people’s property merely because a colliery company satisfied them that the scheme was to the advantage of the public.’ Counsel for Tilden Smith countered this by arguing that the 1923 Act gave the Commission wide powers with the object to facilitate the easy working of minerals and where it was in the national interest to do so. That the rights of private property were over-ridden on terms of fair compensation to the owners. On 16 December 1927, the Court of Appeal published their judgement dismissing the Appeal. The objectors responded by saying that they would Appeal to the House of Lords – but they did not follow this through. During that week, Tilmanstone was credited in raising the largest amount of coal of any East Kent colliery thus far – 6,500tons! Aerial Ropeway entering and exiting the Eastern Dockyard from the cliff face. The major problem, however, was the steep drop from the top of the cliffs above the Eastern Dockyard to the Eastern Arm. Initially the plan was for the Aerial Ropeway buckets to be routed over the cliff edge and down to Langdon Bay. Then to travel along the beach to the Eastern Arm. Work started and the remains of huge concrete platforms in which metal stanchions would have been placed can still be seen. The idea was abandoned as impractical as the Bay is tidal. For the construction of the Eastern Arm, approximately thirty years before, Pearsons had made the concrete blocks out of sand, shingle and cement, the first two were originally brought by ship from Stonar, near Sandwich. The whole exercise was time consuming and expensive such that Pearsons built a Standard gauge Light Railway line from Martin Mill to the top of the cliffs (see Dover, Martin Mill Railway part 1). From there the sand and shingle was taken down the cliff face by a funicular with side tipping skips to ease unloading and this, although not ideal, seemed to be the only answer. However, Tilden Smith’s engineer, Bernard Whitaker, advised that the Ropeway should go through the cliffs in twin tunnels. A survey was undertaken from Northfall Meadow to above the Eastern Dockyard and it was found possible for the Ropeway to go through the cliffs as long as it went through two narrow tunnels. Work on the coal staithe on the Eastern Arm was started in August 1928 at a point where there was 30-feet depth at low water. Built of ferro-concrete by the Yorkshire Hennebique Construction Company, it was 250-feet in length, designed to hold 5000-tons of coal and was supported on two longitudinal rows of ferro-concrete columns. One of the rows was on the parapet wall – evidence of which can still be seen – and the other on the main deck of the Eastern Arm. A shunt rail at the return terminal, at the far end of the staithe, enabled the buckets to gravitate around the south end prior to being picked up once again by the running rope. However, there was no mechanism to correct the buckets so a man had to be there all the time the Ropeway was in operation to return them to the upright position whilst the 2 wheels of the supporting trolley were off the moving rope. The staithe was fitted with a mechanical discharging mechanism that enabled a vessel to be loaded with 500 tons of coal an hour. Besides the man righting the buckets only two other men were required to work the staithe. One was in charge of the conveyors and the travelling feeder under the staithe and the other in the cabin on the travelling tower from which he controlled all the movements of the operation during the loading of a ship. By October 1928 work on further sinking of No 2 and No 3 shafts at Tilmanstone was being undertaken as it was decided to take them both to the deep but rich Milyard seam. By the end of the year, new steel pit-headgear was erected and at a depth of 3,035 feet the seam was reached in May 1930 by No 3 shaft. Tilden Smith had discussions with DHB, who agreed to lease a portion of the Eastern Dockyard to carrying out reclamation works in connection with a cement factory that was proposed on Langdon Cliff. Discussions took place with Dover Corporation to build some 1,000 and 2,000 new homes for workers and their families employed at the new cement and associated industries that were being planned. However, the council declined to support the proposal saying that Tilden Smith had promised to supply electricity to the town but the power lines had still not been built. Eventually, approval was given by Dover Rural Council for 50 houses to be erected in Elvington under a subsidy scheme approved by the Ministry of Health. The houses were built by a Chatham firm. At the time, Tilden Smith was having discussions with DHB, who agreed to lease a portion of the Eastern Dockyard to carrying out reclamation works in connection with a cement factory that was proposed on Langdon Cliff. On 26 October the miners at Tilmanstone, after a great deal of persuading, accepted what was one of the most revolutionary deals of the time when they became part of management structure! A joint management committee was formed but the undertaking did not included profit sharing for as Tilden Smith had pointed out, with such schemes, the men would have to bear the losses and Tilmanstone was making a loss. On 11 January 1929, the Railway and Canal Commissioners’ Court gave permission to cut two tunnels 1,140 feet long, 7-feet wide and 13-feet high, through the cliffs to the Eastern Arm and work started immediately. 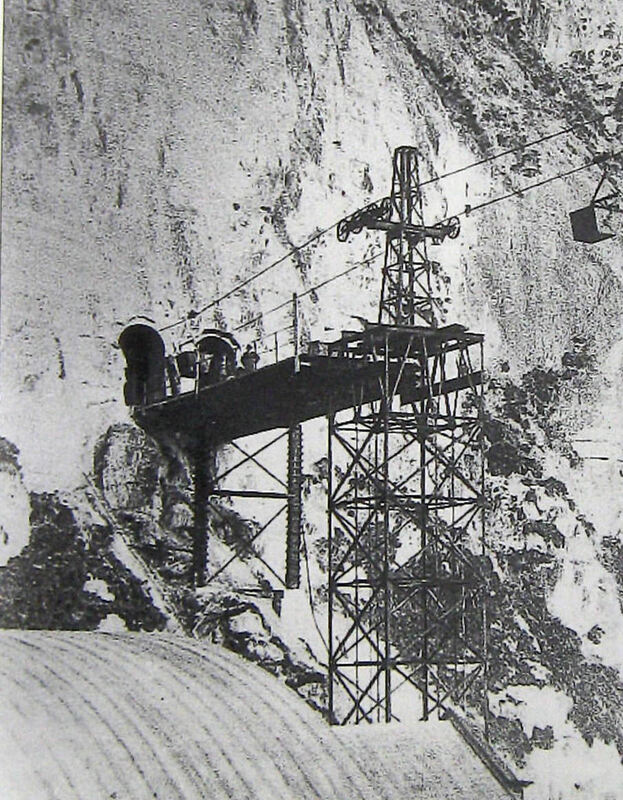 The aerial ropeway was carried in a straight line from Pineham to the top of Langdon Cliff above Langdon Hole where a 90º-angle station was built to take the ropeway through one of the tunnels. A second 30º-angle station was built underground just before the Ropeway emerged above the Eastern Dockyard to enable the Ropeway to run along the Eastern Arm. A third angle station was built at the entrance to the second tunnel to take the Ropeway through but on leaving the exit, the 90º-angle station was used. On the Eastern Arm, the trestles were increased to 70-feet in height such that the buckets passed over the top of the giant staithe. While this was going on, in May 1929, the War Office took legal action against the Channel Steel Company forcing them to pay £1,300 compensation for the breach of covenant over the 24 acres of land on Langdon Cliff that Tilden Smith was leasing from the War Office for his cement works. In 1896, Pearsons had leased that land to lay their railway track from Martin Mill to the cliffs above the Eastern Dockyard with the provision that by December 1899 the site had to be restored to its original condition. They had not carried out the work but up until the receipt of the legal notice, no one seemed concerned. Channel Steel Company paid the compensation and immediately the War Office placed the land on the market and both Tilden Smith and Channel Steel Company put in a bid. The War Office sold the land to the Channel Steel Company who announced that they were going to build a cement factory on the site! However, Tilden Smith held the lease as a sitting tenant and he had also leased, from the War Office, the adjacent land above the twin tunnels. 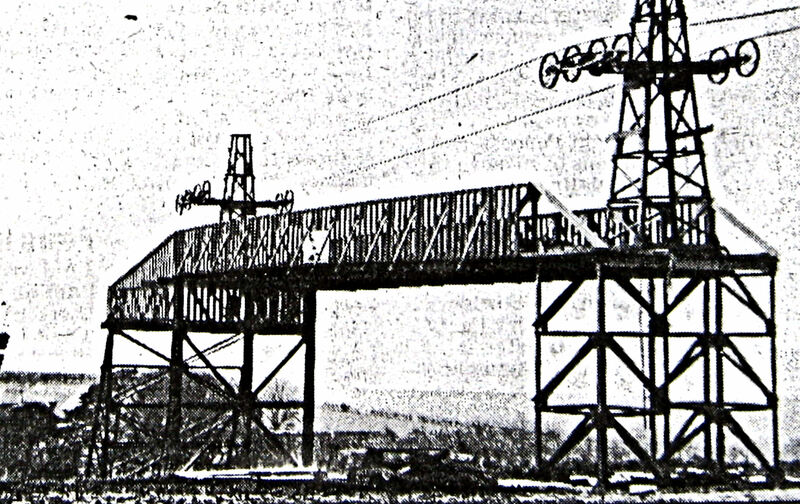 On the Eastern Arm, the trestles for the Ropeway were erected and the wire ropes in position. By the end of the year, the huge staithe was completed. The only obstacle was the agreement between DHB and Tilden Smith over the use of the facility. Members of the Board, undoubtedly the railway appointed members and their supporters, wanted the facility altered to enable Southern Railway to transport coal from the Pearson Dorman Long mines at Snowdown and Betteshanger. It was pointed out that once the coal reached Dover at the Western Docks, it could be carried by the Seafront Railway to the Eastern Dockyard. It was logical that if a lower staithe was adjacent to the giant staithe, they could share the same docking area. Tilden Smith refused to entertain the idea. The main non-maritime event in Dover’s social calendar during the inter-war years was the annual Royal Victoria Hospital fete, usually held on Pencester Gardens and the surrounding streets. The celebrations included the carnival when horse-drawn and motorised vehicles pulled floats (decked out trailers) by different businesses and drove around the town and were judged with prizes awarded. Tilmanstone miners always entered and in 1929, their float featured a mining stall made of wood with two miners burning Coaloid or Tilmanstone New Coal, in a brazier. Tilden Smith paid for the entry etc. on the understanding that a banner was erected stating ‘We burn Tilmanstone coal.’ This was done and the trailer was one of the favourites to win. However, before the judging was completed, the banner caught fire and the float was soon ablaze but was quickly put out by the Dover fire brigade. Not to miss the opportunity, Tilden Smith commented that the accident proved the calorific value of Tilmanstone New Coal! Due to the breakdown in the talks between Tilden Smith and DHB, over the use of the Eastern Arm coal staithe by Pearson Dorman Long, he had to apply to the Railway and Canal Commissioners’ Court for a time extension over completion of the Ropeway. On 25 July the Court permitted the extension and also agreed that royalties paid to landowners above ground of the Tilmanstone colliery areas be reduced on condition that Tilmanstone (Kent) Collieries Ltd owned the mining area below ground. The Company bought the freehold of the mining area below ground for £40,000 paid by annual instalments of £2,000 and underwritten by Tilden Smith. It was also agreed not to build ancillary works on land east of the road running north-south at the side of the colliery. Although the ‘revolutionary’ Joint Management Committee at Tilmanstone colliery was accepted by the majority of the miners, there was still discontent among a few. This was exacerbated by reports coming out of Russia of the halcyon way miners were treated there. It would appear, from what these articles said, that the miners ran the mines they worked in and in consequence enjoyed the best working and social conditions for miners in the world. Tilden Smith was intrigued and at his own expense sent a delegation to look at the conditions with a view to introduce them at Tilmanstone. The group was led by two miners, both of whom believed the reports, J Crane – secretary of the local Labour Party and W (Jack) Roome – a communist. 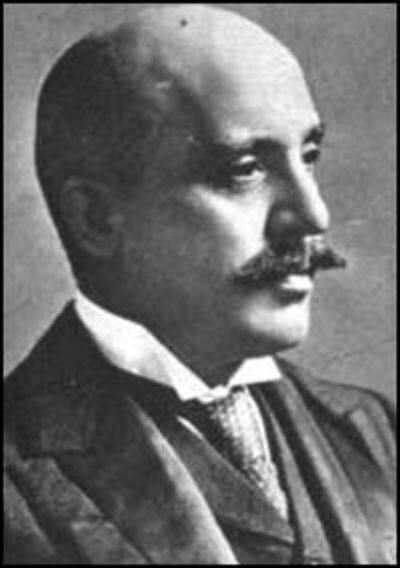 In the deputation was Walter Haydon, a journalist from Dover. They went to the Donetz Basin in southern Ukraine, which at the time was the largest coalfield in Communist Russia. Both miners had been chosen by the other colliers and Haydon’s account of the trip was later published as, Russia as Seen by Two Tilmanstone Miners: A Record of a Tour to the Donetz Basin in August – September 1929. The miners returned disillusioned, as the working conditions were much worse than those in the Kent coalfield while the management at Tilmanstone was infinitely better. Afterwards they had recounted their experiences to the other miners and Tilden Smith offered to pay the passage of any miner and his family who wished to go to Russia. September 1929 saw work start on a building for pithead baths on the main road to the colliery. Consuming 38,000 gallons of water a week, there were 60 baths of the ‘shower’ design and the facility contained 1,008 lockers for the miners’ dirty clothes on one side of the baths and on the other 1,008 for their clean clothes. The baths were connected to the mine by an underground passage to protect the men during inclement weather. Costing £13,000 the baths were provided by the Miners’ Welfare Fund and each miner contributed 6pence a week to use them. There was a small charge for soap and towels for miners who did not bring their own and the facility was opened in October 1930 by Emmanuel (Manny) Shinwell (1884-1986), the Secretary to the Mines Department. The annual sports and garden fete at Elvington Court in 1929 was attended by over 2,000 employees and their families on 22 September. 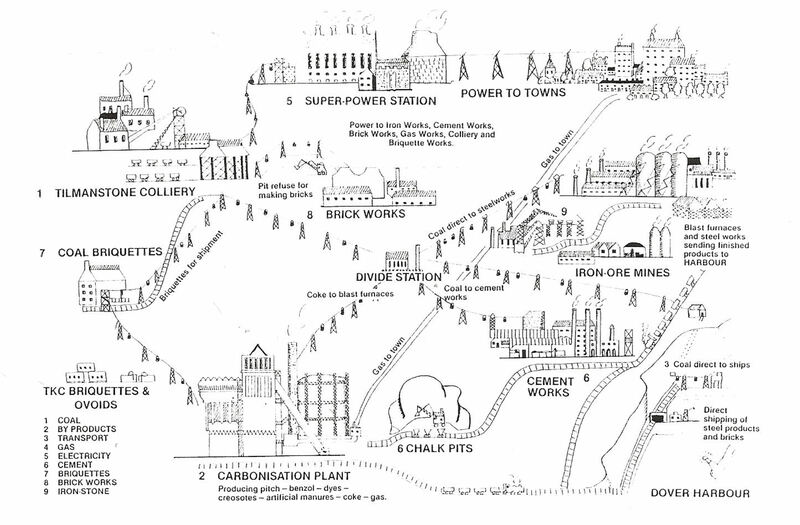 Tilden Smith used the opportunity to outline his plans for the colliery and East Kent describing them as the Industrial Eden. He announced the start of a £2million development programme that would begin before the end of the year and the plans included the completion of shafts number 2 and 3 to the Milyard seam. An electricity power station to be built close to the colliery in order to increase the power to the mine, the aerial ropeway and the many other activities that he planned. He was expecting to supply electricity to distributors in London and plans were afoot to manufacture coal gas for household and industrial use. 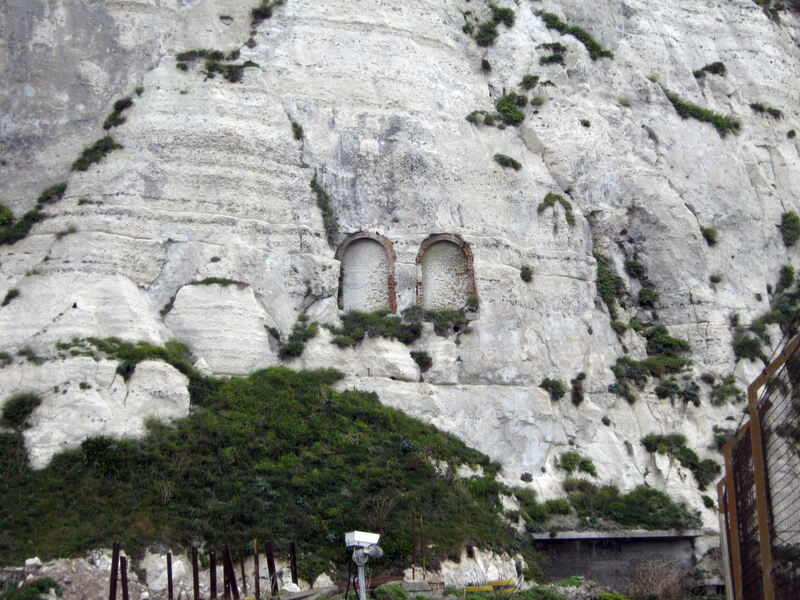 Another proposal was the largest cement factory in the country that was to open the following year on the 24 acres of land at Langdon Cliff, where he planned to utilise the chalk in Dover’s white cliffs, local clay found around Eythorne and fuelled by Tilmanstone coal. Cement would go for export with some retained for the domestic market! To go with the cement, would be bricks, primarily made out of waste products from the mine and the other industries. Other proposals mentioned included the installation of a carbonisation plant and steel production with blast furnaces, rolling mills with by-product plants out of which chemical products would be extracted. For this, Tilden Smith told his enthralled audience, he would not be buying in iron from elsewhere but that it would be dug up from the very earth on which the audience stood! 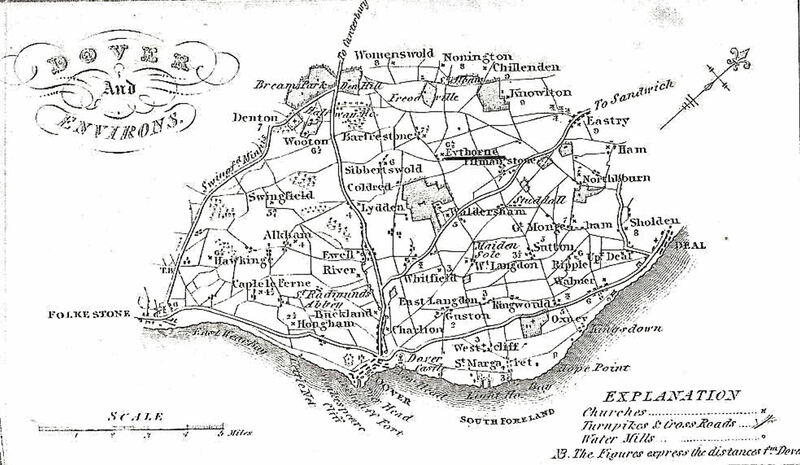 For under the East Kent soil there was not only coal but rich deposits of iron ore and that he was about to acquire leases of the nearby Guilford and Waldershare collieries that had significant iron-ore deposits. Industrial Eden was, he implied, well on the way to reaching its fruition and within four years, the output at Tilmanstone would be 4,000-tons of coal a day, a large percentage of which would be consumed by the Company’s own factories! The first section of the Ropeway, from Tilmanstone colliery to Pineham was formerly opened on 12 October 1929 by, it was later said, some of the invited guests riding down in the buckets to the dividing station. There the wife of Richard Barwick, former Mayor and on the Board of DHB, started the Ropeway. 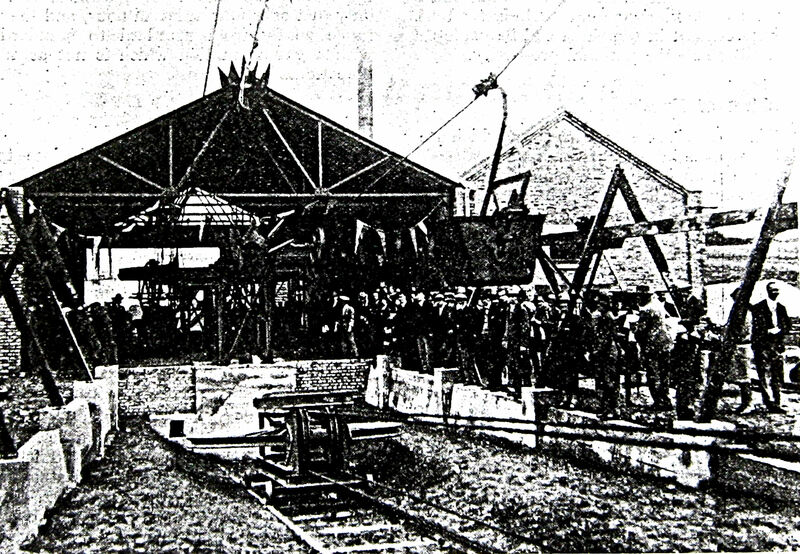 The first bucket arrived from Tilmanstone Colliery 45-minutes later, during which time speeches were made. Afterwards, as a token of appreciation, Tilden Smith gave Mrs Barwick a model of the Ropeway, constructed by his engineering department and made of silver plated solid brass. The model consisted of two trestles connected with ‘ropes’ on which were suspended a couple of miniature buckets. Tilden Smith had acquired, by October 1929, a controlling interest in the Deal and Walmer Gas Company, the Folkestone Gas and Coke Company and the East Kent Gas Company. The latter was formed in 1923, and supplied gas to the rural areas of East Kent. The Company also held most of the remaining shares in the Deal and Walmer Company and controlled Whitstable Coke and Gas Company. That month Tilden Smith set up the Dover Coal, Gas and Power Company with the stated intention of co-ordinating the companies and supplying them with gas produced from a low temperature carbonising plant to be built near the colliery. This, he stated, was cheaper than the gas produced by the high temperature process that was favoured by the previous owners of the companies. Tilden Smith’s planned gas works was expected to produce 1,000 cubic-feet of gas each hour of operation and as bi-products of the coal used, Coaloid or Tilmanstone New Coal along with artificial manure, benzene, creosote, dyes and pitch would be manufactured. On 18 December 1929, Tilden Smith was in the House of Commons with friends to lobby Parliament. A new Coal Bill was under discussion and Tilden Smith was again putting forward the argument for compulsory amalgamation of all collieries under a single Coal Board on terms that would ensure both the independence and prosperity of the British coal mining industry. As the group was going into lunch, Tilden Smith suddenly collapsed and died. He was survived by his wife and four daughters, his only son had died as a result of mustard gas poisoning sustained during World War I. At the time of Tilden Smith’s death, Tilmanstone Colliery was the second largest coal-producing colliery in East Kent – 7,560 tons of coal was raised during the week Tilden Smith died. The Aerial Ropeway was finally finished in January 1930 and the formal opening took place on 14 February 1930 but due to the death of Richard Tilden Smith the ceremony was a simple one. Mrs ‘Pip’ Edridge, eldest daughter of Richard Tilden Smith and S Hare, the Managing Director of Tilmanstone (Kent) Collieries Ltd, started the Ropeway. The first ship to be loaded with Tilmanstone coal was the collier Corminster belonging to Messrs W Cory and Co. The consignment was for Barking Power Station for pulverising before being fed to the boiler furnaces. – Tilmanstone’s colliery mineral area was 7,956acres of which 1,706acres were freehold. – The Ropeway was designed and installed under the supervision of Ropeways Ltd, Aldwich House, London – later British Ropeway Engineering Company. – The Ropeway was 12,300yards long and it took one and three-quarter hours from when a bucket left Tilmanstone Colliery to reach the staithe on the Eastern Arm at Dover. – The altitude at Tilmanstone colliery was 198feet and the difference in level between the loading station at the colliery and the discharge station on Eastern Arm was 100feet. – The driving power at the colliery was a 200-horsepower Robey vertical engine and the speed of the Ropeway was 4¼ miles an hour. – There were 585 buckets on the Ropeway, an empty bucket weighed 5hundredweight and had a load capacity of 16hundredweight. – The maximum coal transfer rate was potentially 267 tons for each hour of operation. – The interval between the dispatch of buckets was 21.4 seconds and the distance between buckets was approximately 46yards. – The rope was 4inches in circumference (1.273 inches diameter), had a breaking strain of 8tons and was made by W T Henley Telegraph Wire works, Holborn Viaduct, London E C1. – The continuous wire rope was supported by 177 trestles, 30feet high and each weighing 3½tons. On average they were positioned 75 yards apart. – The trestles were made by Ropeways Ltd, Aldwich House, London – later British Ropeway Engineering Company. – On the trestles were one, two or four wheels fitted into compensating balance beams to support the rope and at no point were there any more than two buckets between any two trestles. – The Ropeway was approximately 30feet above ground level; the clearance below the buckets was 12-feet rising to 20-feet over roads and railway lines. – The Ropeway traversed 15 roads and 2 railways and the crossings were protected by girder-type bridges. These were 20feet wide with the longest having a span of 100feet. – The dividing station at Pineham was 3½miles from Tilmanstone and sited 261feet above sea level. Here the buckets transferred from one running rope to the other by means of a shunt rail upon which the 2 wheels of the support trolley ran along, aided by gravity. – Both sections of the Ropeway were driven from the dividing station by a 60-65 horsepower Belliss & Morcom steam engine. Twin sets of driving and tensioning gears were fitted. – There were three angle stations, one on the cliffs and the second and third near the seaward end of the tunnels. – The two tunnels were 1,140feet long, 7feet wide, and 13feet high and at the seaward end they were 87feet above sea level. – The coal staithe was built of ferro-concrete by the Yorkshire Hennebique Construction Company, was 250feet in length, designed to hold 5000tons of coal and was supported on two longitudinal rows of ferro-concrete columns. 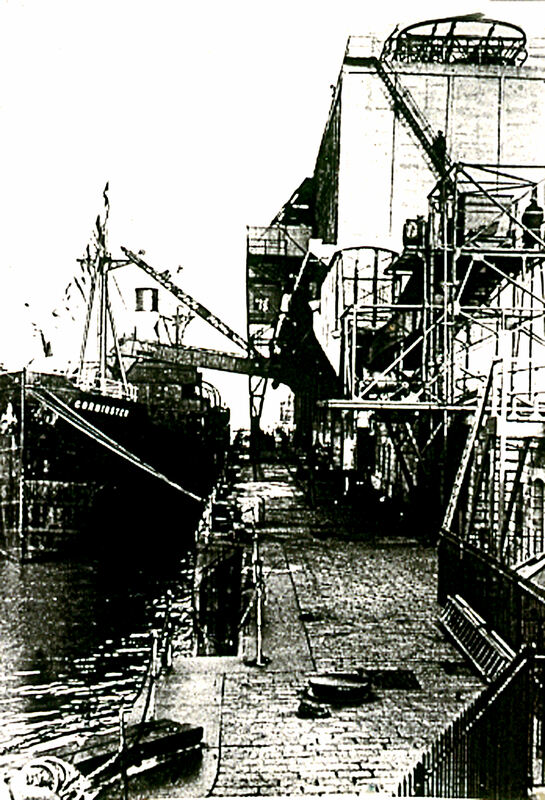 – The staithe was divided into ten divisions with 20 discharging doors and the coal was carried on a series of conveyor belts from the holding bunker to an automatic weighing machine and then down a chute into the ships hold. 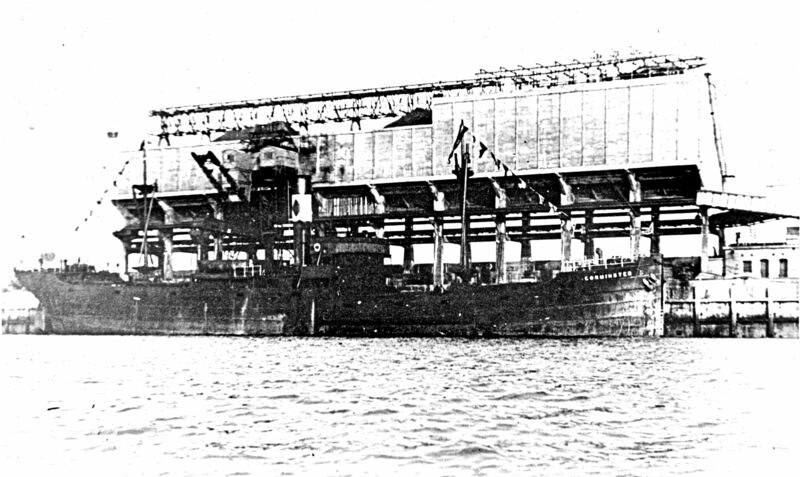 – The automated plant had a capacity of 12tons a minute enabling ships to be loaded at a rate of 720tons an hour. – The motive power for the staithe was derived from the steam engine at the Pineham dividing station and used nine electric 500-volt motors to drive the staithe operations. Three men worked at the staithe. – Total Ropeway’s litigation fees amounted to £20,000 and the total cost of the undertaking was estimated to have been £170,000. – The Ropeway cost £125,000 and the coal staithe£25,000 and was capable of carrying 3,000 tons of coal a day from Tilmanstone Colliery to Dover’s Eastern dockyard at a cost at the time of the official opening, of 1s 9d (8.75p) per ton against 5s 9d (28.75p) by rail. The carrying capacity of the Ropeway was greater than the average daily output of the colliery, of around 1000 tons of coal a day in 1929. The gross value of Richard Tilden Smith’s estate was given as £880,495 9shillings 6pence, with net personal wealth of £686,996 2shillings 8pence gross (proved 1933). In his Will Tilden Smith left provisions to meet costs likely to accrue to DHB and were met until July 1937. The money came from the Tilden Smith Trust that was permitted to operate the colliery for seven years. At the time of Tilden Smith’s death, it was estimated that there was enough coal to last 300years if mined at 5,000 tons a day. Albeit, due to the final crisis caused by his death, all envisage projects were stopped including work on the two shafts to the Milyard seam. Tilmanstone (Kent) Collieries Ltd appointed FD Mottram as the Secretary of the reconstruction of the colliery, a position he held until 1952. His initial main concern was making the Beresford seam pay its way. Due to losses, no dividends were paid, and the Tilmanstone Branch of the Kent MineWorkers’ Association agreed to voluntary wage reductions in order to prevent closure. The Aerial Ropeway, at first, lived up to expectations except at the staithe, which quickly proved to be dangerous for the three-man team working there. A number of accidents were reported and in 1931 Noel Bragden was killed and Jack Hamerton seriously injured, when they were buried in fine coal. After the fatality there appears to have been a number of technical problems that brought the Ropeway to a standstill. Already laying railway lines in the eastern Dockyard, in the spring 1930, DHB laid two railway tracks along Eastern Arm to the staithe. The up railway line ran underneath the staithe and the down line ran on the harbour side. Before the opening of the giant staithe, Tilmanstone (Kent) Collieries Ltd were approached by Southern Railway regarding building a second smaller staithe for coal from Snowdown and Betteshanger collieries. This time, the project was agreed and by the day of the opening of the Aerial Ropeway scaffold had been erected for the low coal staithe. The lower staithe was paid for by Southern Railway and was for coal from Snowdown and Betteshanger collieries. However, during 1933-1934, due to the prevailing world economic recession, the amount of coal carried by the Ropeway and the railway was severely reduced but did pick up as the decade progressed. A large percentage of the coal and coal products for the London and Home counties markets were carried from Tilmanstone colliery by the East Kent Light Railway to the railway junction at Shepherdswell. From 1930 to 1939, the Light Railway carried between 210,000-tons and 250,000-tons of Tilmanstone coal every year. Besides carrying coal from Tilmanstone to the Eastern Arm, the use of the Ropeway was leased to other companies to carry minerals from the mine. One such company was Hamerstley Ganister Company of Durham who leased the Ropeway in 1931 in order to carry waste products to a railway siding for transportation by rail to Durham. There the waste products were used in the manufacture of firebricks. The Ropeway crossed farmland belonging to William Brown for a distance of 1,600-yards. He asked for wayleave rent of £200 a year, the amount he received before the reduction sanctioned by the Railway and Canal Commissioners in July 1929. Hamerstley Ganister offered 2pence a yard plus 7shillings6pence for each trestle sited on the farmer’s land, which altogether amounted to £18 a year. The land, they told the Court, was used for grazing so the Ropeway did not interfere with its usage. Farmer Brown lost but sought an Appeal in the High Court and again was unsuccessful. From Tilden Smith’s death up until 1935 the issuing of first mortgage debentures raised further capital for the mine. In July 1925, this had amounted to £122,710 and by 1935, there were £678,165 first mortgage debentures. The National Metal and Industrial Finance Company Ltd and its wholly owned subsidiary, London Mortgage Trust Ltd predominantly held these – two companies set up by Tilden Smith. When the Tilden Smith Trust cease to operate the colliery, in July 1937, the controlling interest in the Tilmanstone (Kent) Collieries Ltd was acquired by the Harley Drayton Group and about the same time, the company acquired control of the National Metal and Industrial Finance Company. 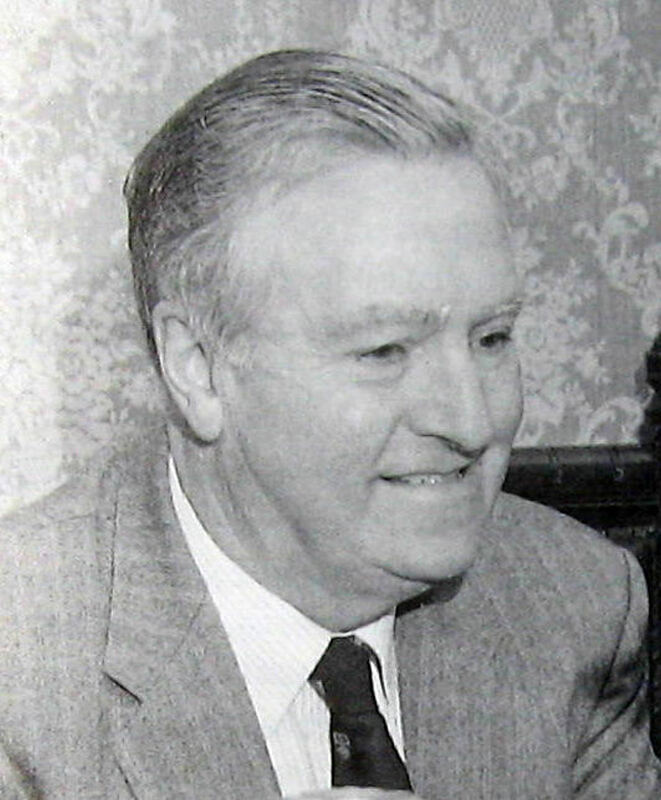 That same month Tilden Smith’s family estate sold their inherited interests to the Anglo-French Investment Consolidation Ltd also part of the Drayton Group. Affiliated to the Group was the British Electric Traction Company who stated that they were looking at building on the ideas expressed by Tilden Smith as his ‘Industrial Eden.’ Of interest, the British Electric Traction Company was the parent company of the East Kent Road Car Company, that operated the East Kent bus services. At the start of World War II (1939-1945), the Ropeway ceased operation abruptly though the demand for coal ensured that Tilmanstone colliery was profitable and these profits were retained to develop the two shafts to the Milyard seam. Coal was still in the buckets when the Ropeway closed and would later spontaneously combust looking very pretty but a hazard from fire and from enemy attacks. Further, soldiers stationed near the Ropeway used both the trestles and the buckets for target practice. The Kent Coalfield undertakings were transferred to the National Coal Board as part of the Nationalisation of collieries on 1 January 1947. At that time, the net colliery assets were given as £276,376 but for 1946, the mine had recorded a net profit of £65,610. 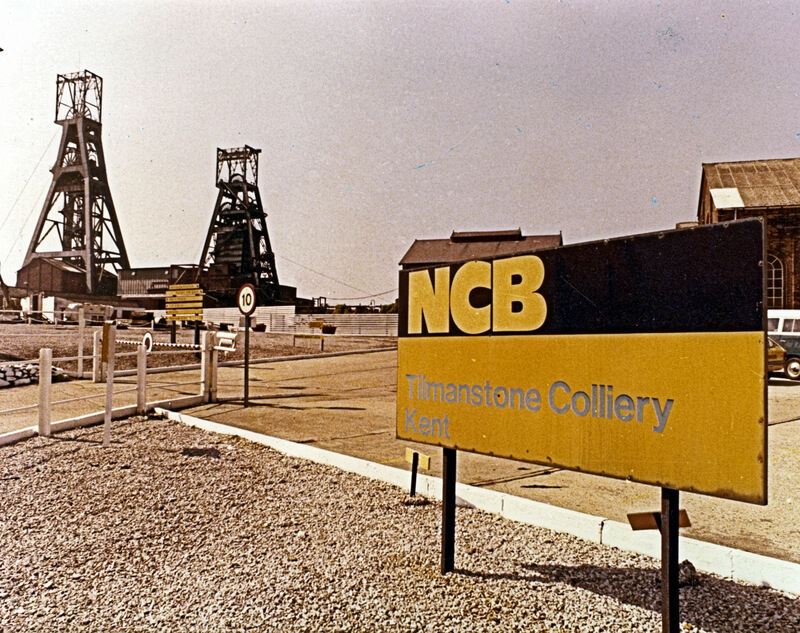 Tilmanstone was extensively modernised after Nationalisation but was always considered uneconomic by the National Coal Board and from 1967 was earmarked to close. It closed along with Snowdown in 1987, Chislet had closed in 1969. The last colliery in the Kent coalfield to close was Betteshanger on 28 August 1989. During its working life Tilmanstone produced 20million tons of coal. There were three shafts, No1 = 1,590-feet deep to the Beresford seam, No2 = 3,168 and No3 = 3,139 to the Milyard Seam. All three seams were sealed during 1987. Remains of the initial plan for the Aerial Ropeway. Buckets were to be routed over the cliff edge above Langdon Bay and then to the Eastern Arm. Colin Varrall. As part of property assets at the time of Nationalisation, the Aerial Ropeway was transferred to the DHB. They saw it as uneconomic to repair and in 1952, work started on dismantling the Ropeway when the buckets and wire ropes were removed. Over the following two years, the trestles and bridges were demolished and what could be sold, was. The coal staithe on the Eastern Arm was knocked down in 1955 and at the same time, the smaller coal staithe was removed. Traces of the Aerial Ropeway across the countryside can still be seen but the best view is the two sealed tunnel entrances above Eastern Docks. This entry was posted in Aerial Ropeway and Richard Tilden Smith, Aerial Ropeway and Richard Tilden Smith, Aerial Ropeway and Richard Tilden Smith, Buildings, Businesses, Eythorne and Elvington, Kent Coal Field, People, Routes, Tilden Smith Richard and the Aerial Ropeway, Tilden Smith Richard and the Aerial Ropeway, Tilden Smith Richard and the Aerial Ropeway. Bookmark the permalink.